Originally, we featured this handy flat fixing kit in our guide to things you’ll definitely want before your next triathlon. Check it out for more cool stuff to help you get through all three phases of your next tri. But first, read ahead for our full review. A totally silent, totally easy way to make sure you’ve got everything you need to repair a puncture and re-inflate your tire all in one neat package. Pop this into one of your bottle cages (on your frame or behind your seat, if you’re into that), and go. It’s super sturdy and I never had a problem with it ejecting or even rattling around. 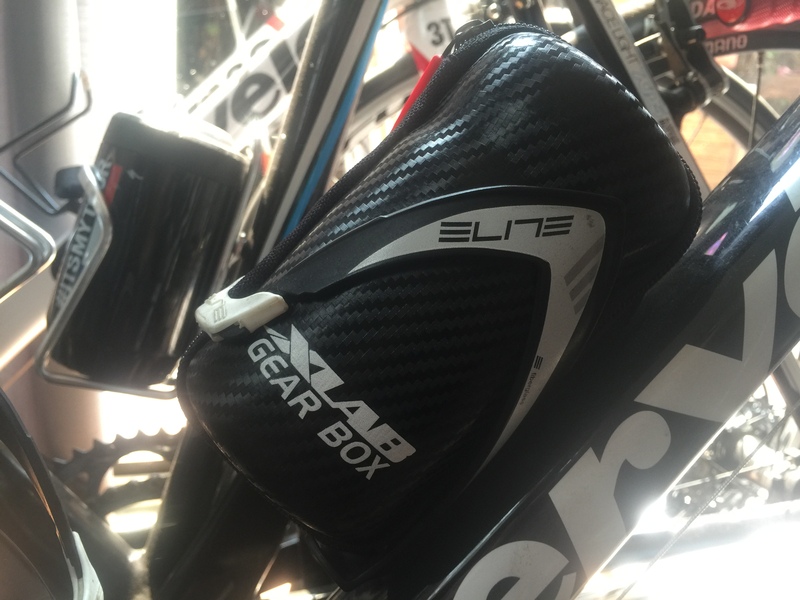 The carbon-look finish not only has style, but is textured so that the pod stays put in the cage. Inside, the padding makes certain you don’t hear the contents shifting around (in case they actually do move). One of my favorite bits here is the mini multi-tool with a clip-on style open wrench–it’s magnetic, and just a little extra awesome. Plus, the space inside lets you squeeze a tube and full kit in much easier than in a small saddlebag–not to mention the install is much faster and the tools much easier to get to. The patch kit and giant levers might not be the style for everyone here, especially if you’re not in to glueless patch kits (but we have a guide to going glueless here). But a quick swap with your favorite set does the trick nicely. You can, however, buy just the Gear Box without the tools or flat kit.